Season the chicken with salt and pepper. Heat the oil in a heavy bottomed Dutch oven over medium-high heat. Cook the chicken until browned on both sides and remove. Add the sausage and cook until browned, then remove. Sprinkle the flour over the oil, add 2 tablespoons of margarine and cook over medium heat, stirring constantly, until brown, about 10 minutes. Let the roux cool. Return the Dutch oven to low heat and melt the remaining 3 tablespoons margarine. Add the onion, garlic, green pepper and celery and cook for 10 minutes. Add Worcestershire sauce, salt and pepper, to taste and the 1/4 bunch parsley. Cook, while stirring frequently, for 10 minutes. Add 4 cups hot water. Add the chicken and sausage. Bring to a boil, then reduce the heat, cover, and simmer for 45 minutes. Add tomatoes and okra. Cover and simmer for 1 hour. Just before serving add the green onions, shrimp and chopped parsley. 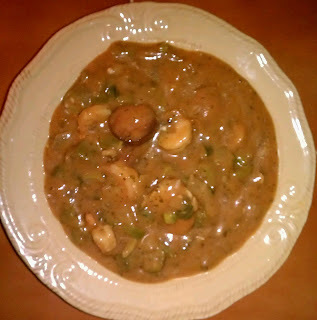 I've never made a gumbo- looks and sounds delicious! I may give this recipe a try. This was my first time making gumbo and my family loved it! yumm..i think the hubby will like this..thanks for the new recipe! Our Top Ten Moments of 2011!